The Turkish company is engaged in manufacturing and designing of valve systems and is able to provide solutions to any valve application with customized engineering capabilities. The company’s product can be listed under the main categories of filters, valves and flanges. 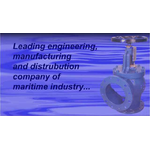 Izzet Cakan Gemi Mazlemeleri is experienced in designing and manufacturing valve systems for sea vessels. The company also offers customized engineering support for providing the best solution to any valve application. The company is willing to establish contacts with the potential partners that are active in marketing equipments of ship related industry. The company is seeking trade intermediaries that could promote their products in the foreign markets in this regard.